↑ 1.0 1.1 "The World Factbook – Burma". cia.gov. สืบค้นเมื่อ 4 May 2016. 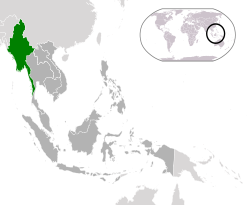 ↑ 3.0 3.1 3.2 3.3 3.4 "Burma (Myanmar)". World Economic Outlook Database. International Monetary Fund. ↑ "ราชบัณฑิตฯ-กอ.รมน.ให้ใช้ "โรฮีนจา" แทน "โรฮิงญา"". สปริงนิวส์. 8 พฤษภาคม 2558. สืบค้นเมื่อ 8 พฤษภาคม 2558. ↑ "Burma". Human Rights Watch. สืบค้นเมื่อ 6 July 2013. ↑ "Myanmar Human Rights". Amnesty International USA. สืบค้นเมื่อ 6 July 2013. ↑ "World Report 2012: Burma". Human Rights Watch. Archived from the original on 30 June 2013. สืบค้นเมื่อ 6 July 2013. ↑ Madhani, Aamer (16 November 2012). "Obama administration eases Burma sanctions before visit". USA Today. ↑ Fuller, Thomas; Geitner, Paul (23 April 2012). "European Union Suspends Most Myanmar Sanctions". The New York Times. ↑ Greenwood, Faine (27 May 2013). "The 8 Stages of Genocide Against Burma's Rohingya | UN DispatchUN Dispatch". Undispatch.com. สืบค้นเมื่อ 13 April 2014. ↑ "EU welcomes "measured" Myanmar response to rioting". Retuer. 11 June 2012. 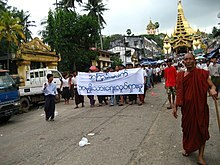 ↑ "Q&A: Communal violence in Burma". BBC. สืบค้นเมื่อ 14 October 2013. ↑ Eleven Media (4 September 2013). "Income Gap 'world's widest'". The Nation. สืบค้นเมื่อ 15 September 2014. ↑ McCornac, Dennis (22 October 2013). "Income inequality in Burma". Democratic Voice of Burma. สืบค้นเมื่อ 15 September 2014. ↑ "2015 Human Development Report Summary" (PDF). United Nations Development Programme. 2015. p. 210. สืบค้นเมื่อ 9 November 2016. ↑ Aung-Thwin, Maureen. (1989). Burmese Days. Foreign Affairs. ↑ Fogarty, Phillipa (7 August 2008). Was Burma's 1988 uprising worth it?. BBC News. 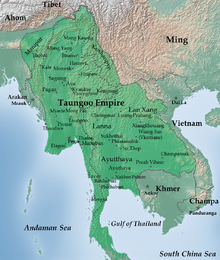 ↑ , Geography of Myanmar. ↑ 29.00 29.01 29.02 29.03 29.04 29.05 29.06 29.07 29.08 29.09 29.10 29.11 29.12 29.13 29.14 The Union Report: Census Report Volume 2. The 2014 Myanmar Population and Housing Census. Nay Pyi Taw: Ministry of Immigration and Population. 2015. p. 12. Kemp, Hans (2013). 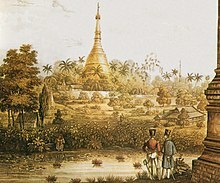 [Burmese Light, Impressions of the Golden Land] (illustrated with text by Tom Vater ed.). Visionary World. ISBN 962856370X. หน้านี้แก้ไขล่าสุดเมื่อวันที่ 21 เมษายน 2562 เวลา 20:14 น.